Reintroducing Belle Époque - Cesame's classic, late 19th century-style design returns, combining Old World elegance with New World ease. 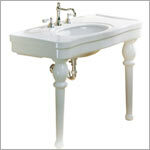 In addition to the stately pedestal wash basin, Belle Epoque now offers single or double basin designs with a choice of ceramic, chrome or gold legs. The metal legs can be fitted with a chrome plated metal shelf system to provide abundant space for towels and toiletries. With this new line, it is no longer necessary to sacrifice space for style. Belle Epoque caters to individuals with classic taste and a modern lifestyle.